Fluorescence is a great technique for microscopy. It provides amazing contrast and allows us to selectively view the objects that interest us without being obscured by surrounding structures. The one big drawback it has over brightfield microscopy techniques is bleaching. Even the brightest fluorescently labeled samples will eventually fade. However, there are several things you can do to prolong the effective fluorescence and capture some great images before they fade into oblivion. Use DIC or Phase Contrast to find your sample. After you place your sample on the stage, don't switch to fluorescence immediately. Use brightfield illumination such as phase contrast or DIC to find a suitable area to image. Once you find the right spot you can take a quick peek with fluorescence to make sure the fluorescent label is visible. Unless you are using very dim fluorophores, you most likely will not need the full power of your UV light source. Most LED based light sources allow you to adjust the light intensity. Start with the lowest intensity and gradually increase it until you can just see the structure you want to image (it doesn't have to be that bright - remember that your microscopy camera will pick up a lot more light than your eyes do). On confocal or other laser-based systems a laser power of just a few percent is often sufficient for a well-labeled sample. If you are using a mercury or xenon lamp, consider using an attenuator to limit the amount of light reaching the sample. 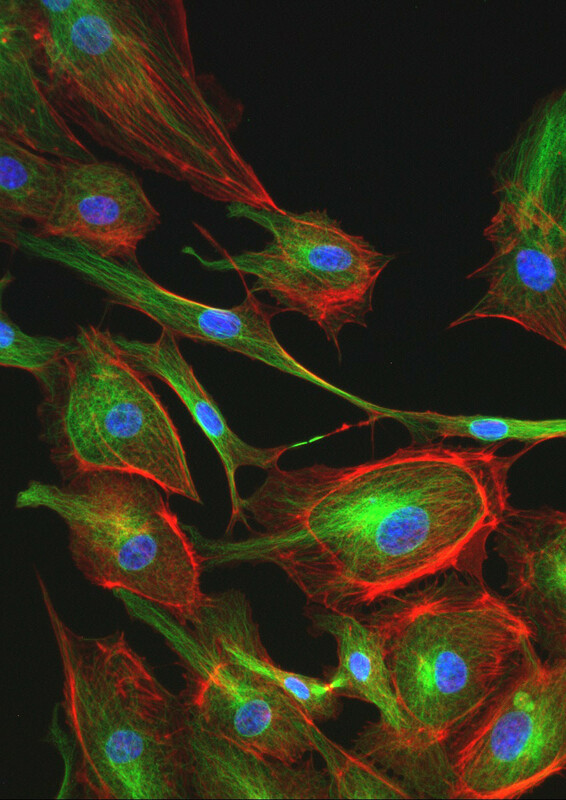 Dedicated microscope cameras have been optimized for fluorescence imaging and have many features that will allow you to collect data as quickly as possible before your sample fades. Avoid color cameras as the Bayer mask in front of the chip absorbs a significant amount of light. Check your camera's operating manual for settings such as gain, binning modes, sub-frame readout, and dynamic range. All of these can be adjusted to increase image capture speed but there is usually some cost in terms of noise or resolution. Some camera control interfaces allow you to use high-speed features in a preview mode (for example, while you’re focusing the sample) and then automatically switch to a high quality mode to capture the image. It is a good idea to test camera settings on a positive control or spare sample before imaging your critical experiment. Use objectives with high numerical aperture values. The higher the numerical aperture of the objective, the more light will be collected from the sample which, in turn, allows you to reduce the exposure time. Find the objective with the highest numerical aperture that will still give you the field of view that you need. If available, use oil immersion objectives as they typically have a higher NA than comparable dry lenses. If you have a motorized Z-drive on your system, you may be tempted to use some of the enhanced functions that this feature offers such as autofocus and Z-stack imaging. While these may be necessary if you are doing timelapse imaging or you have thick specimens, keep in mind that you are prolonging the exposure of your sample to fluorescent light when you use these features. There is considerable variability in the brightness and stability of many of the fluorophores typically used in fluorescence microscopy. Before you grab the first fluorescent dye you can find in your freezer, take a moment to look up the quantum yield (brightness) and photostability of the dye. These may not always be easy to find but picking the right fluorophores can save you a lot of trouble later on. Using an anti-fading agent in your mounting medium can dramatically decrease the speed of bleaching in your sample. There are some home brew recipes available but commercial products such as ProLong and VECTASHIELD are not too expensive and work extremely well. Use dedicated, high-efficiency filter sets. Many fluorescence microscopes come with a standard filter set for imaging red, green, and blue fluorescence. These work well enough for routine imaging with a variety of common fluorophores such as DAPI, FITC, TRITC, Texas Red and even GFP. That versatility comes at a cost, though, as these filter sets usually don’t have the highest transmissions and the broad band pass values can cause bleed-through when imaging dyes that are spectrally close. If you know you will be doing a fair amount of imaging with a particular fluorophore, it is probably worthwhile investing in a dedicated, high-efficiency, filter cube for that dye. If you have questions regarding fluorescence microscopy please contact Microscope World.